The 2015 maple sugaring season has officially begun! That means I have a brand new maple recipe to celebrate! 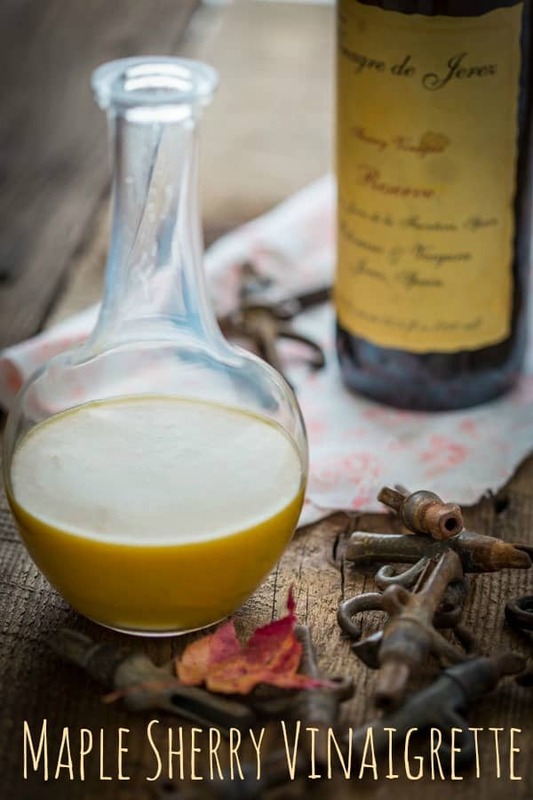 It is this amazing maple sherry vinaigrette recipe! 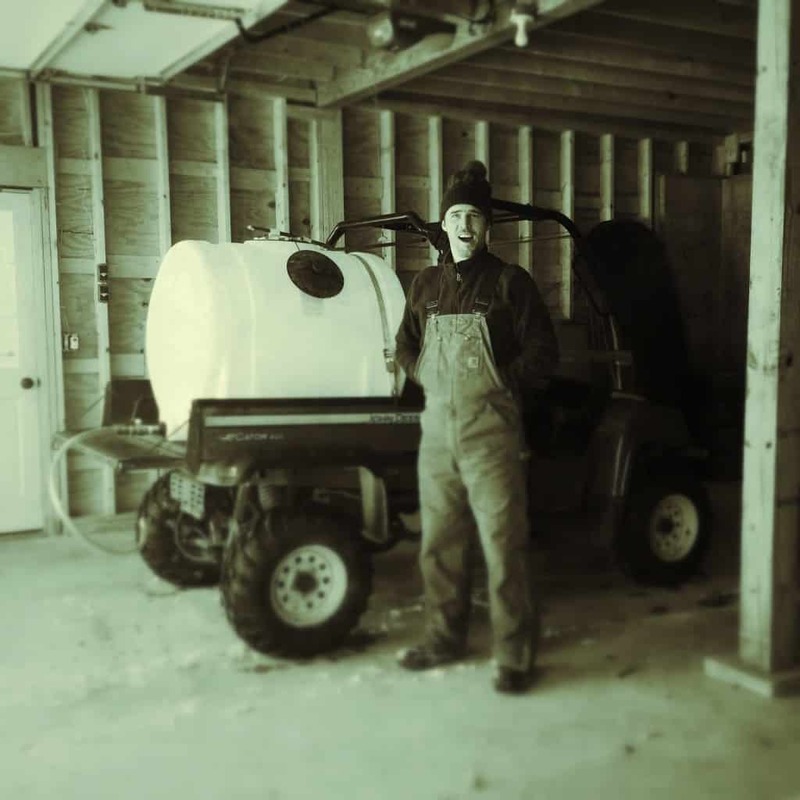 Last night after dinner, Jase set up our evaporator for the season, and I drove the Gator around (now dubbed the Sap Mobile — see below) and collected sap. This is why for the month of March and April Jase calls me the Sap Wench. Should I be offended? I think not, because I feel kinda badass doing it. So sorrynotsorry to say it, sugaring season means that it’s officially time for me to talk about maple even more than I have been! Don’t say I didn’t warn you. Try it and you’ll see what I mean. It is pretty amazing. I think I may like this maple sherry vinaigrette more than maple balsamic at the moment. 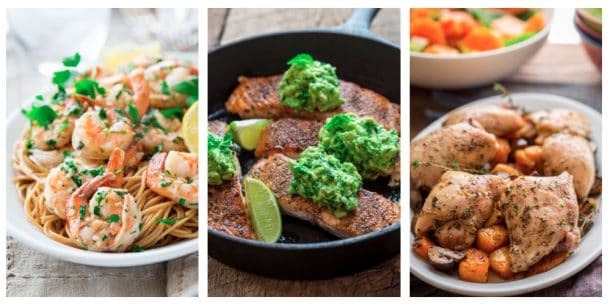 And I have added this recipe to the Best of Healthy Seasonal Recipes. Because, I’m telling you, it is the best! And #mapley!! One quick thing. It is very strong flavored so use less than you think you need, then taste the salad and add more if you want. I think that’s because sherry vinegar is very strong and can kind of knock your socks off. Making homemade vinaigrette is incredibly easy, not to mention the stuff you make yourself is free of all the nasty thickeners, sweeteners, and stabilizers found in the store-bought dressings. To make this maple sherry vinaigrette, you simply have to add fresh garlic, maple syrup, olive oil, Dijon mustard, sherry vinegar, and a pinch of salt into a blender. Blend it all up until smooth, and then give it a taste. (You might want to add more salt, depending on your taste preferences). One word of caution: don’t add more garlic to this vinaigrette recipe, even if you really love garlic. Why? Because raw garlic is incredibly strong, and you don’t want it to overpower this dressing. One small clove is truly all you need, promise! 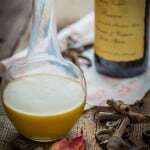 To store this maple vinaigrette, pour it into a jar or another container that can be sealed tightly. This homemade vinaigrette will keep in the fridge for about a week, maybe a little longer. This dressing is likely to harden in the fridge due to the olive oil; if that happens to yours, just leave it on the counter for 10 to 15 minutes before you plan on using it. Give it a good shake before pouring onto your salad, and enjoy! 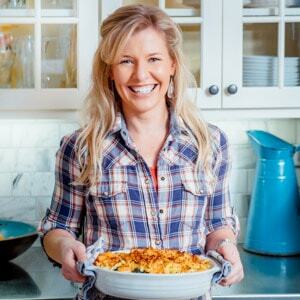 There are more maple recipes here too if you are looking for sweet inspiration. 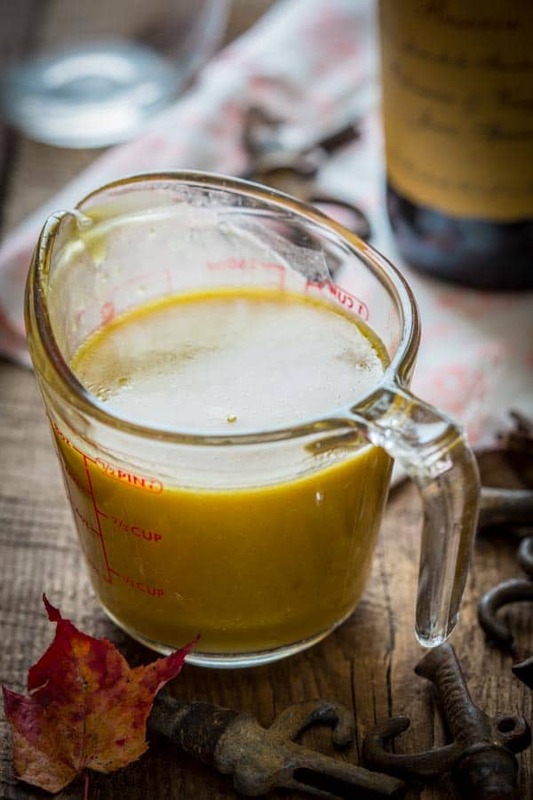 This maple sherry vinaigrette is a paleo, gluten-free and vegan salad dressing recipe. It’s also refined sugar-free and tastes great on any salad! Puree garlic, oil, vinegar, maple syrup, Dijon and salt in a blender, mini prep, or with an immersion blender in blending jar until completely smooth. I could seriously drink this! My husband’s Grammy (the best cook i have ever met) always adds a little maple to her vinaigrette when she does tossed salads with dinner. I’ll have to show her your recipe, I know she’d love it! PS thanks for inviting me in on all this maple fun. So glad you could do it my friend. And I love knowing that about your husbands Grammy. It is a tried and true method to make salads amazing! I love to use maple making my salad dressings too. This is a great vinaigrette, Katie. Thank you so much Angie. Glad this one appeals to you. Have a great day my friend. I love maple anything. I have a maple dijon salad dressing that I love so i’ll have to try this one too. I’d also like to try making maple fudge this year. That is music to my ears Julie, since I love maple anything too. You have a sap mobile?! That is crazy cool, lady! To say I love maple syrup is an understatement- luckily, us Canadians are all about the maple syrup! This maple sherry vinaigrette sounds perfect for all my salads! The sap mobile is so fun! And you’ll love this Genevieve. It really is a maple lovers combo. I am so excited to try different combinations of salad goodies with it. Up first is chevre, almonds and craisins. That’s right you came up for Blog Brule at Smuggs. I can’t wait to get up there in a few weeks for some R+R. Have a great weekend Min my friend. You rock that “Sap Wench” name girl! You guys should do maple sugaring tours (maybe when your book comes out for next season.) Im fascinated by the process. And I love me some maple syrup in my salad dressing. Ha ha, did you see my hashtag on insta yesterday #callmesapwench ? It was like a little inside joke with myself. Now you can join me in the joke Deanna. Lol. So excited to see you next week. I’m so jealous!! Fingers crossed that I win the giveaway. 😉 I love maple AND skiing. And this vinaigrette, too. Obviously. You will have to come for sure next year if you don’t my friend. Have you been up to Smuggs’ before? I can’t wait to head up in a few weeks. Just heard they are doing an 80 minute maple massage at their spa!! Oh my! Maple lovers unite Alanna. I love the sugaring process too. All it is is taking the water out by evaporation. So cool that’s all it takes. Hopefully you win then, because once you are hooked on the real stuff there is no turning back. Thanks for entering Rebecca! I put maple syrup in my oatmeal! I grew up in PA and I always used brown sugar on my oatmeal. Now that I live and breathe maple here in VT, there is no contest. Maple all the way! My favorite way to use maple syrup is obviously on waffles, but what a great idea to add it to salad dressing! well I think this just might have to be my new favorite way. I’d drizzle it on lamb and with roasted vegetable and salad. OH MY! Oh with lamb! That sounds incredible. I am now going to have to try that! I love to use pure maple syrup on pancakes and French toast. I just love it poured over pancakes, waffles or French Toast. You are my go to when it comes to dressings and here’s another one to make- I’ve recently started using maple on meats- so good! Mixed with dijon too- perfect! I love maple and Dijon together too Arman. It is a great combo. Do you see much pure maple syrup in Australia? It’s really rare to come across- Some supermarkets do stock it, but it is insanely expensive! Good to know Arman. Glad you are using it. Have a great day! I use maple syrup on top of pancakes! Love to make them on the weekends! I so want to see how maple syrup is collected and processed. It is top on my bucket list! I live in PA and there really are no places to go to experience this. I might have to get my husband to bring me up for Maple Fest! Jennifer, it is such a great experience. Vermont’s maple open house weekend is coming up on the 28th and 29th this year which coincides with the maple fest at Smuggs’. Most of the sugar makers open up their sugar houses to the public so you can see how it all happens. It is a lot of fun.